The temperature was set to 0.1 Kelvin. The Si layers are strained pseudomorphically with respect to a Si0.75Ge0.25 substrate (buffer layer). Self-consistent solution of the Schrödinger-Poisson equation within single-band effective-mass approximation (using ellipsoidal effective mass tensors) for both Delta conduction band edges. 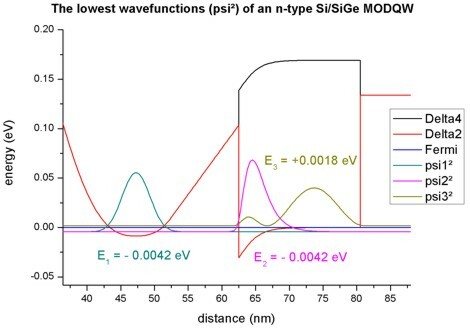 The following figure shows the self-consistently calculated conduction band profile and the lowest wave functions of an n-type Si/Si0.75Ge0.25 modulation doped quantum well (MODQW) grown on a relaxed Si0.75Ge0.25 buffer layer. 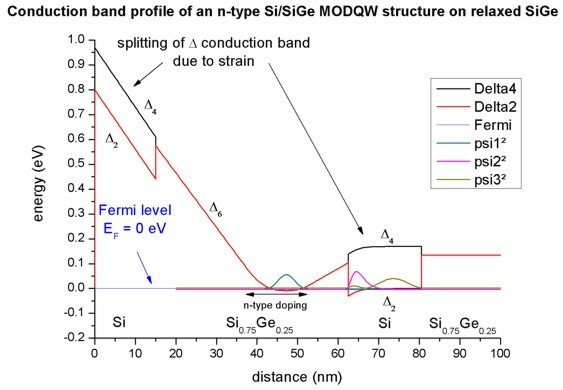 The strain lifts the sixfold degeneracy of the lowest conduction band (Delta6) and leads to a splitting into a twofold (Delta2) and a fourfold (Delta4) degenerate conduction band edge. The following figure shows the lowest three wave functions (psi²) of the structure. Two eigenstates that have very similar energies and are occupied (i.e. 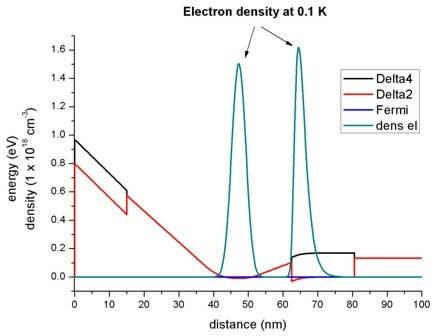 they are below the Fermi level) whereas the third eigenstate is not occupied at 0.1 K.
The electron density (in units of 1 x 1018 cm-3) is plotted in this figure. The lowest states in each channel are occupied, i.e. are below the Fermi level.